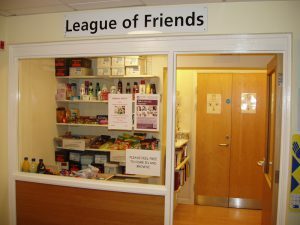 The League of Friends has been raising funds for the benefit of the Hospital and wider Community for nearly 50 years. During this time it has raised and spent well over £2 million. These funds provide additional hospital facilities for both patients and staff; facilities that the NHS are unable to fund but the Community deserves. 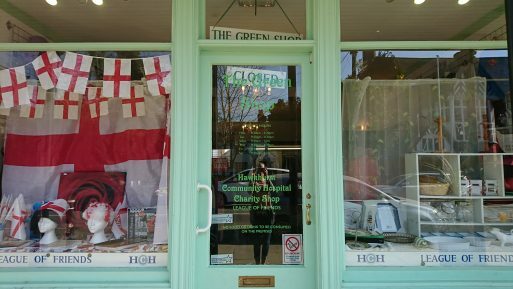 The Green Shop: A charity shop opened in 2010 on the Colonnade. This has been a huge success in very large part due to Carole Williamson and Sandie Buckles who were instrumental in setting it up and then running it. The Shop is now Managed by Marianne Relf. More details can be found here. Visit The Green Shop page. Membership: We enjoy a healthy membership and always welcome new members who wish to support our work. To find out how to help click here. Fetes: The League of Friends always partakes in a variety of ways at the Hawkhurst Summer Fete and Hawkhurst Christmas Festival. Donations: We are fortunate to receive funds throughout the year from individual donations and group donations raised by many local clubs, teams and organisations. If you wish to donate click here. Equally we also benefit greatly from donations in memory of loved ones. A gift in memory of your relative or friend is a very special way of remembering them and sometimes people request that people give a donation instead of flowers at a funeral. For more information please click here. Bequests: We regularly receive funds from generous gifts made in peoples Wills. For more information on our benefactors click here. Many people in the Hawkhurst area have cause to be grateful for the treatment they or their relatives have received from the Hospital. By leaving a gift to us in your Will you will enable the League of Friends to continue to support the work of the hospital and staff and provide valuable amenities. Click here for more information click here.